Salt and Light Television to release a new documentary illustrating the role of Christians in the Holy Land. TORONTO - May 5, 2014 - PRLog -- Salt + Light Television’s newest documentary Living Stones: Walking Humbly in the Land we Call Holy will premiere on Sunday, May 18, 2014 at 9:00pm ET. Sponsored by the Catholic Near East Welfare Association (CNEWA), a group of journalists took part in a study tour to the Holy Land. With them, Deacon Pedro Guevara-Mann travelled through Jordan, Palestine and Israel meeting Christians and learning about the work they do. 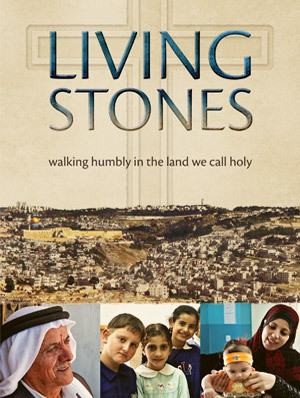 Produced by Salt + Light Television, Living Stones illustrates the role of Christians in the Holy Land and the importance of keeping the testimony of Christ alive. The Living Stones DVD is available for sale at www.saltandlighttv.org/store and will also be available on Vimeo On Demand. Born on the wings of World Youth Day 2002 in Canada, Salt + Light is a unique instrument of the New Evangelization. It is dedicated to being, and helping others become, the salt of the earth and the light of the world. The mission of Salt + Light is to proclaim Jesus Christ and the joy of the Gospel to the world by telling stories of hope that bring people closer to Christ and the Catholic faith.